Every community in the United States has the potential to transform itself into this kind of ecosystem that supports families and promotes digital inclusion. But to do so, community leaders will need to take purposeful steps toward modernizing their family engagement and early learning plans. Too often, they risk chasing after the new shiny object without a clear path for prioritizing efforts and ensuring they are effective. Today, New America's Education Policy Program and the Joan Ganz Cooney Center at Sesame Workshop are releasing a new report to guide city and community leaders. Our report, How to Bring Family Engagement and Early Learning into the Digital Age, is designed to help these leaders and other policymakers examine what is needed and update their plans by taking integrated approaches to the use of libraries, schools, multimedia spaces, and through home-based Internet connectivity services. Promoting early learning through the support and empowerment of families—especially those who are under-resourced—has become an imperative for education leaders nationwide. In 2014, New America published Envisioning a Digital Age Architecture for Early Education to help leaders visualize success in this media-infused environment. Since then, New America and the Joan Ganz Cooney Center at Sesame Workshop have joined forces to document initiatives using digital tools to connect with vulnerable families and improve educational outcomes. Interactive tools such as on-demand video and text messaging are being used to inspire and reassure parents, to share learning materials between formal and informal settings, and to bring parents closer to their children’s learning. Some communities are also taking steps to prepare educators as media mentors to help families and children be choosy about media and learn how to use digital tools for learning. But so far, these efforts are sporadic and fragile. Very few are fully sustainable or ready to scale up. Community leaders need a plan. Our hope is that this report will generate that planning. Think of it as a companion to existing guidance, such as the Building Blocks for Success framework from the Center for the Study of Social Policy and the National League of Cities, which is already helping communities to build early learning communities. It is also designed to be complementary to the work of the 200+ communities that are part of the Campaign for Grade-Level Reading and other collective-impact efforts around the country. 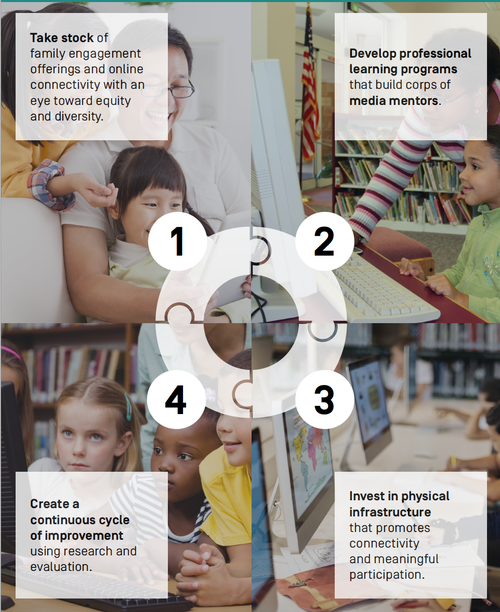 The report describes four actions to help community leaders prioritize: take stock, develop professional learning programs, invest in physical infrastructure, and create a cycle of continuous improvement. Over the coming year, with support from the Joyce Foundation, which provided the support for this report and previous work on our Integrating Technology in Early Literacy mapping initiative and corollary analysis, our two institutions will continue to provide resources and tools for policymakers and decision-makers at all levels. To learn more, and to see examples of communities that are already embarking on the report's four steps, read the full report.